In an unusual move, Stern Pinball have announced a second Premium edition of their upcoming Metallica game. Having already announced a Premium model, they have responded to criticism of the original Premium artwork and overall look of that variant with an all-new Dirty Donny Premium model. This model returns to the caricature design of the LE and the Pro, and features exclusive cabinet and backbox artwork. There had been criticism of the 'flight case' design of the previous Premium model and the lack of custom beatnik-style artwork on the translite. This new Premium model addresses both those concerns. MELROSE PARK, IL – April 18, 2013 – Stern Pinball, Inc., the world’s leading maker of real pinball games and the AAMA 2012 Manufacturer of the Year, announces the availability of a second Premium model Metallica pinball machine. 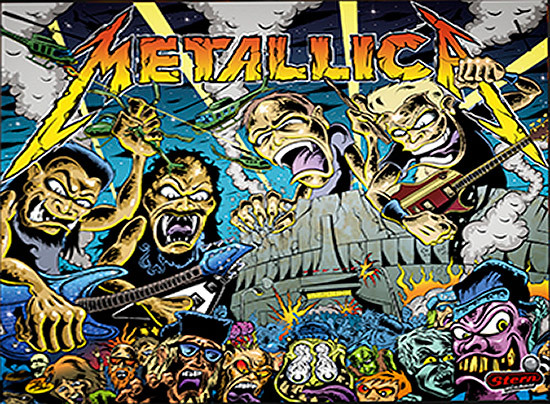 The initial release of Metallica pinball captured the attention of gamers and fans alike. Stern sold out of both the US and International allocations of its 500 Limited Edition (“LE”) games within an hour of each respective customer announcement. The second Premium edition machine features the vibrant artwork of Dirty Donny Gillies and complement’s Stern’s Metallica LE, “Road Case” Premium and Pro models. The new Premium edition Metallica game boasts the same action-packed features as the Road Case Premium model and highlights the addition of Dirty Donny’s radical pop art creations. Dirty Donny is considered one of the most influential artists in the pop culture scenes of underground rock, punk and heavy metal. He is widely known for his creative work on concert posters, album covers and vinyl toys. For a glimpse of the game in action, Stern Pinball will be showcasing the Metallica pinball machine at Comic-Con International in San Diego this year with Nuclear Blast Records. The Metallica game continues both the Stern Pinball and the Stern family tradition of producing quality pinball machines for young and old. The company traces its lineage to Philadelphia in the 1930s when Sam Stern entered the business of operating pinball games. Sam Stern subsequently became part owner and president of Williams Manufacturing, a pioneer in the pinball industry. Sam passed his lifelong enthusiasm for the game and the business of pinball to his son Gary Stern who founded Stern Pinball. Today pinball remains one of America’s favorite pastimes. The Metallica pinball machine is available while supplies last through authorized Stern distributors and dealers. 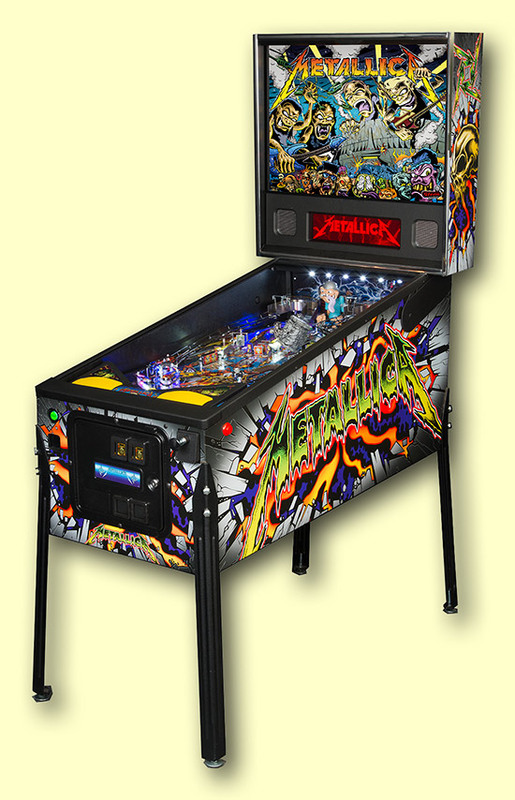 To learn more about The Metallica pinball games and Stern Pinball, visit www.sternpinball.com. Stern Pinball, Inc., headquartered just outside Chicago, Illinois, is the leading producer of pinball games in the world. Stern’s highly talented creative and technical teams design, engineer and manufacture popular arcade-quality pinball games. Recent popular Stern titles include Avengers, X-Men, AC/DC, Tron, Transformers, Avatar, Iron Man, Batman, Spiderman and many more. All of Stern’s pinball games are crafted by hand and assembled by Stern’s expert team. Both pinball enthusiasts and casual players around the globe enjoy Stern’s games. For more information visit www.sternpinball.com.